The great thing about landscaping your property is you can turn it into your ideal space to work, play, and relax. From water features of ponds or pools, to places for yourself or your pets to relax, landscaping your exterior has almost limitless options. Today, we’re looking at sporting installations that can be done on your property – with the primary example of installing a sand volleyball court. Options like this are perfect on larger estates, or for vacation homes where recreation rule supreme, especially on beachfront property. 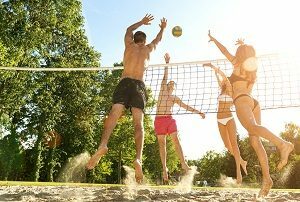 Whether you’re looking to get a volleyball court installed for casual party fun or for a serious volleyballer in your house, you’re looking at very similar construction. Here are a few key features to keep in mind. The standard volleyball court is 18 by 9 meters or roughly 60 by 30 feet. This should be expanded with 10 feet of space on all sides for safety and serving, for a total of 80 by 50 feet, though this can be reduced depending on size constraints. The major work here will be the excavation of the actual court so it can be installed with sand. Much like with grading for a patio or other landscape construction, excavation is deep: at least 1.5 feet with an ideal depth of 3 feet. Then the area is filled with gravel, followed by a filter of landscape fabric, and finally with sand. It’s important to pick the right sand. Ideally, you’re looking for beach sand or another fine-grained sand – coarser sand will cause injuries as it can abrade the skin. Washed masonry sand can also work, and will give you additional options when it comes to colors. Of course, some excavation also needs to be done for pole installations for the net. Designs vary depending on the type of poles and net you purchase, but we recommend a concrete footing for them to avoid tilting, with removable poles to be able to store when not in use. Depending on the soil density, you may need additional drainage. A drainage ditch or weeping tile (also known as a French drain) can be installed to avoid standing and pooling water in the court. Basketball Hoop and Court: While it’s a classic move to install a hoop over the garage or use a standing hoop in the street, think about taking it a step further with a half or full court in the backyard. Golf Putting or Chipping Green: Work on your short game with a putting green and whole, or even a chipping green if you have the estate to spare. If you’re looking for assistance in making the perfect sporting installation for your home (or for your employees), it’s time to contact us. At Greener Horizon, we provide top-level landscape design and master planning as well as landscape construction. Contact Greener Horizon today to learn more about our landscaping services and full estate management services, and request your complimentary consultation today.